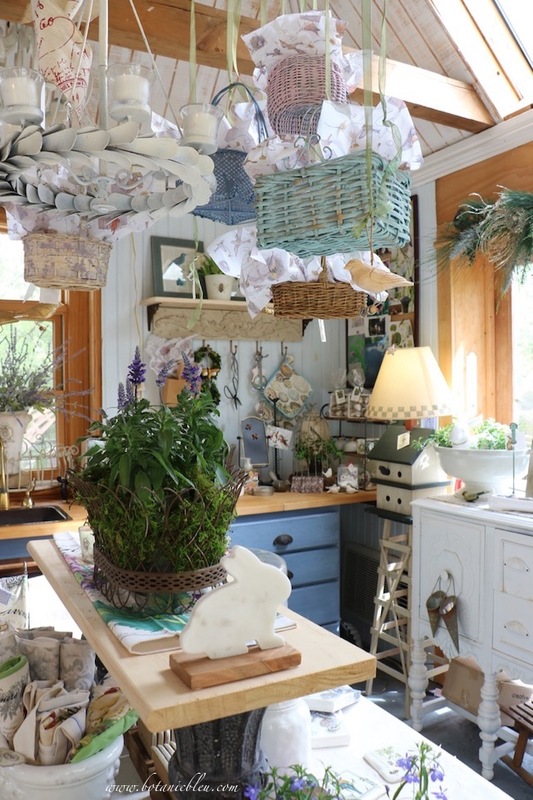 The backyard garden shed is filled with Spring inspiration, and the ceiling has a display of Spring baskets hanging from ribbons. 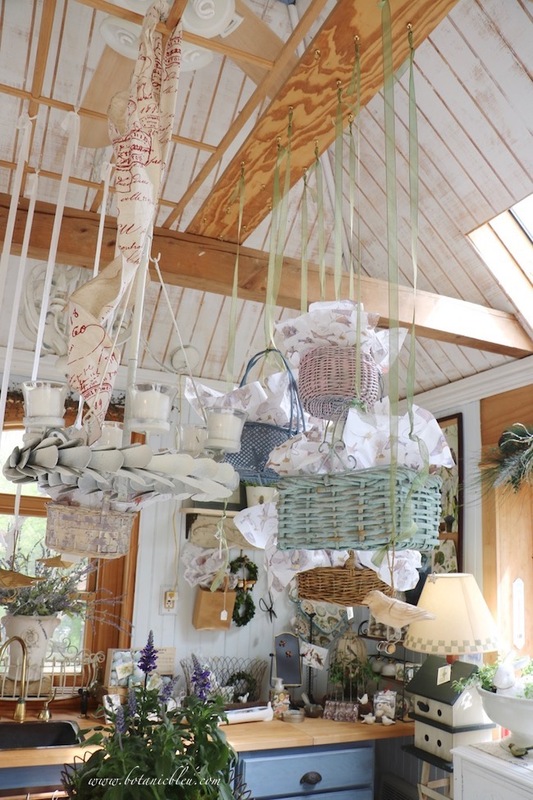 What was my inspiration to hang baskets from the ceiling? When I was thinking about what represents this season of the year, my mind began to think of Easter which led to Easter baskets. A collection of five baskets have two things in common. All have handles which makes it easy to hang them. All are some variation of woven wood . . . rattan or split reed. Their styles are similar, but not exactly the same. There are three different shape styles. One is rectangular, two are round, and two are oval. No two colors are the same. Four are pastel colors and one is a natural wood color. While the colors vary, all evoke Spring. 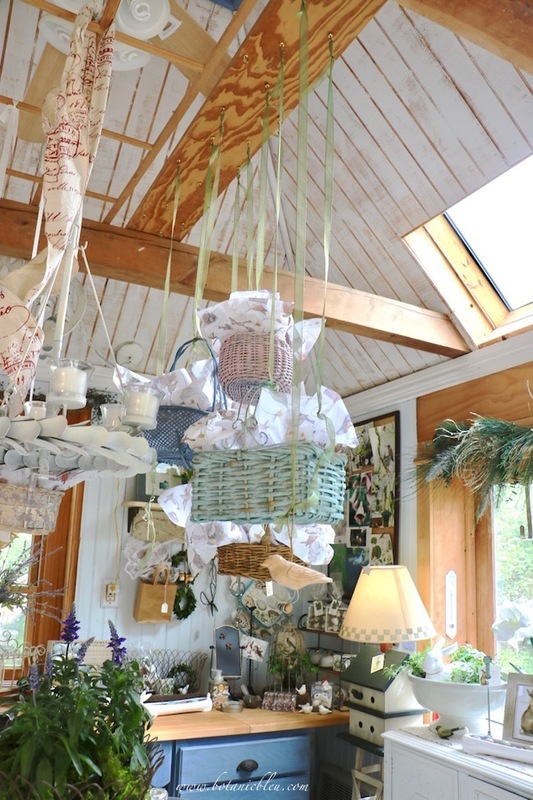 The baskets hang clustered over a table in the center of the room which insures no one will bump into the baskets. Four of the five baskets hang from a solid wood board lying atop the two wood cross beams in the ceiling guaranteeing the weight of the baskets is supported. Good design calls for finding ways to pull together objects so they are viewed as a whole, but with some differences to make the display interesting. One of the ways to unify the display of varied baskets is by using the same brass colored cup hooks screwed into the solid wood board. 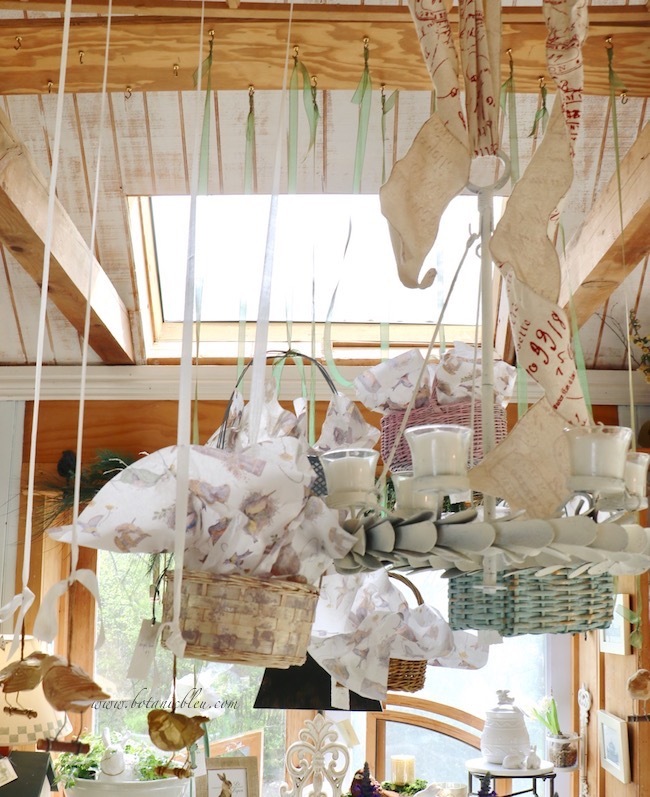 A second unifying design feature is by using the same green ribbon from which to hang four of the baskets. The fifth basket hangs from a white ribbon suspended from a wood grid that also supports the hanging white candelabra. A cluster of wood carved birds also hang by more white ribbons dropped from the wood grid. A Le Lapin (the rabbit) tag attached to each basket is a third unifying design feature of the display. 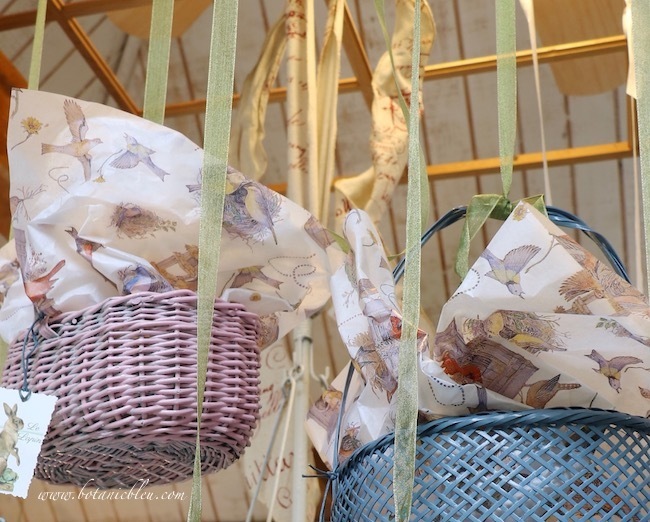 The fourth unifying design feature in the ceiling basket display is the bird patterned tissue paper used in all of the baskets. 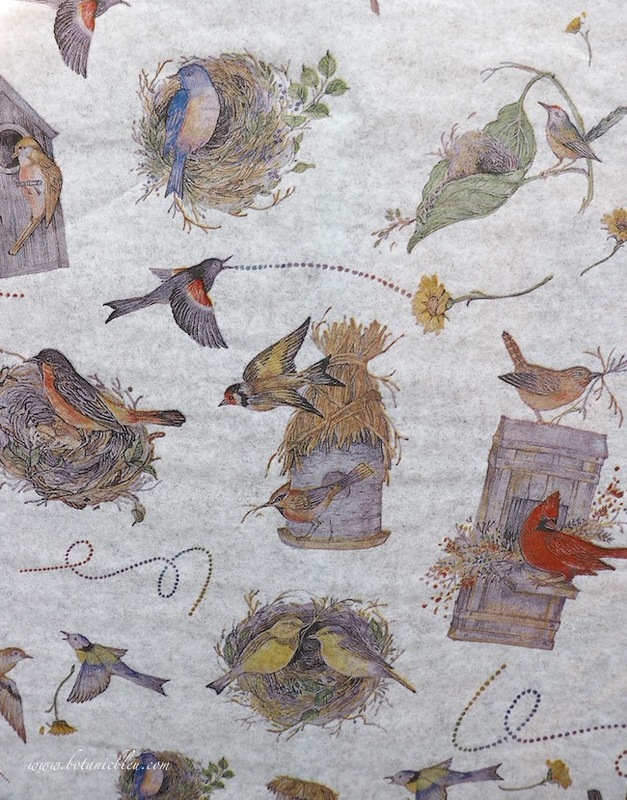 The paper has a range of soft colors, red, blue, green, yellow, brown, gray...., and a variety of birds, nests, and houses. Isn't the bird nest in the soft green leaf just the sweetest of all? Two significant design features that provide interest are hanging the baskets at different heights and at different angles from one another. Baskets in Spring colors hanging from the ceiling are a beautiful display for this time of the year. Do you have a group of baskets collected over the years? Then you can create a similar display as the one in my garden shed. 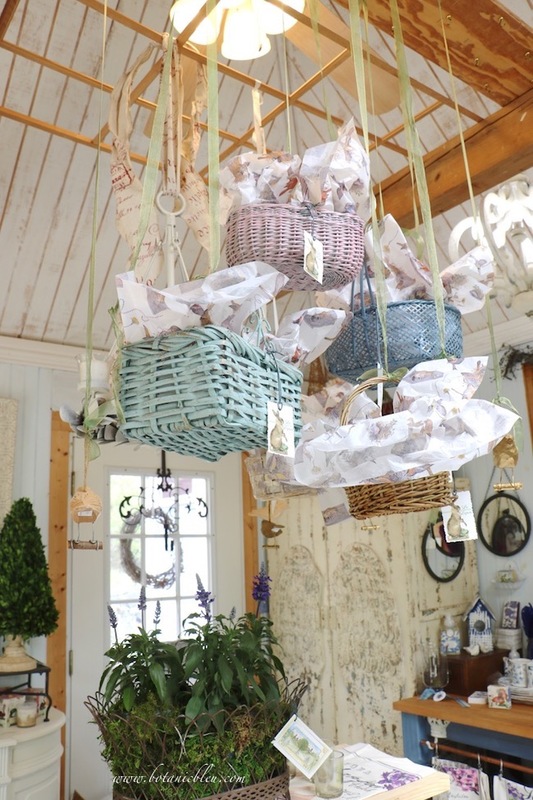 Old Easter baskets make a fabulous seasonal display hanging over a kitchen island or a dining table. A pot rack or a suspended wood grid can be used to hang the baskets. Use a beautiful seasonal tissue paper, a special hanging ribbon, and an adorable bunny tag on each basket to unify the basket display. This is so cute, Judith!! For the average girl who doesn't have a shop, I can picture this for a shower or party. Love it! 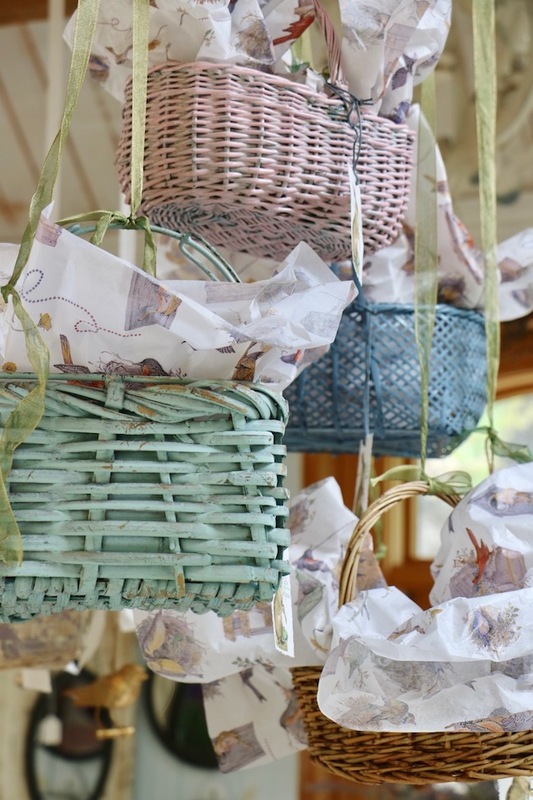 So pretty and I particularly love the patterned tissue paper used in the baskets. 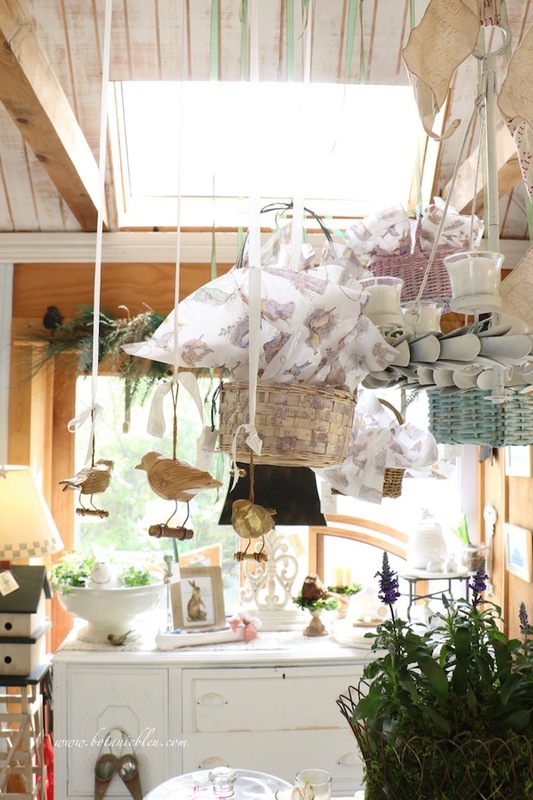 Your garden shed is really cute dressed up for Easter. So pretty! I love the soft pastel colors of the baskets and how they draw the eye up into the room! The tissue paper you used was the perfect complement to the display! I wish I had such a fun little garden shed to decorate and have fun in! Oh that is a darling display! This looks like such a fun space to decorate! I love your garden shed it is my dream to have one and I I love yours. Just pinned this post. Judith this is the cutest basket display ever! Maybe by next year I'll figure out a spot like this to create one. Pinning for inspiration! I love this idea, Judith! So pretty, and such a wonderful place to get to decorate!